A journey into two of New Zealand's unique national parks in one day. 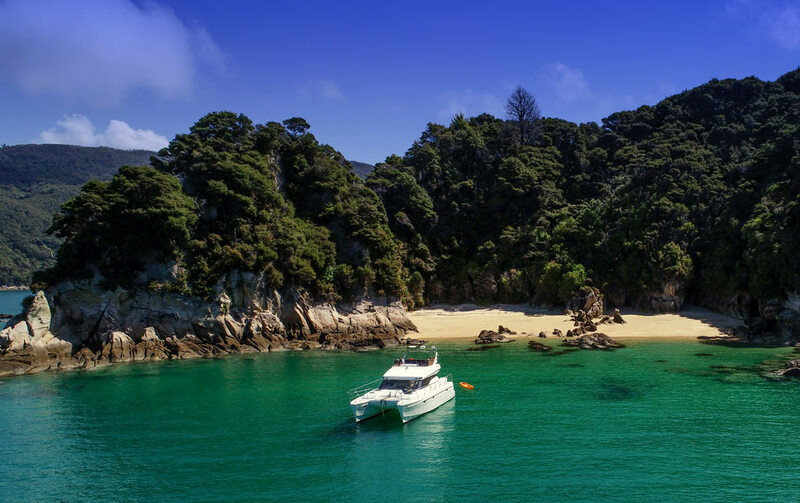 Join us for a private cruise to the beautiful Abel Tasman National Park. Discover lush bush, golden sands and heavenly blue water before escaping the sea to soar over breathtaking Kahurangi National Park on a luxury helicopter flight over Lord of the Rings country and beyond. Departs: Recommended departure time 10.00am from Stephens Bay - one way cruise through the Abel Tasman with walking and kayaking opportunities. After lunch we cruise up to Awaroa to meet the helicopter at 3.00pm for 2 hours of spectacular scenery. $6295 for 1 to 6 passengers in the Eurocopter/Squirrel. We would like to thank you for a FANTASTIC day on your boat! We enjoyed every moment! This was truly worth it! Thank you for your comments, information, lovely lunch and for giving us (and especially Granny!) wonderful memories to take with! THANK YOU!! Perfect First question of the trip: what did we especially want to see or do? Rod knows the area with its flora, fauna and coastal waters like the back of his hand, as he grew up in the area. He is also obviously very much in love with the place and proud to show off its beauties to folks like us. Our comment back was 'beautiful scenery, birds, and animals; we want to take lots of photos'. He did not disappoint.